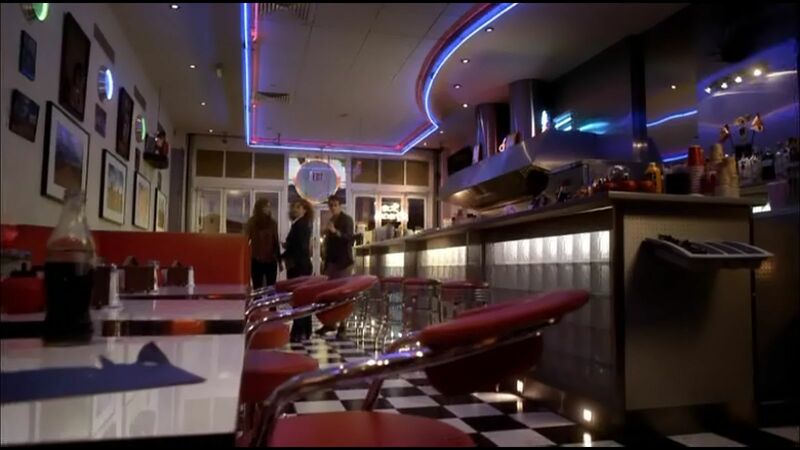 In the series 11 episode 12 Hell Bent, the Doctor seems to "return" to the diner of series 06 episode 01 The Impossible Astronaut, or so it would appear. 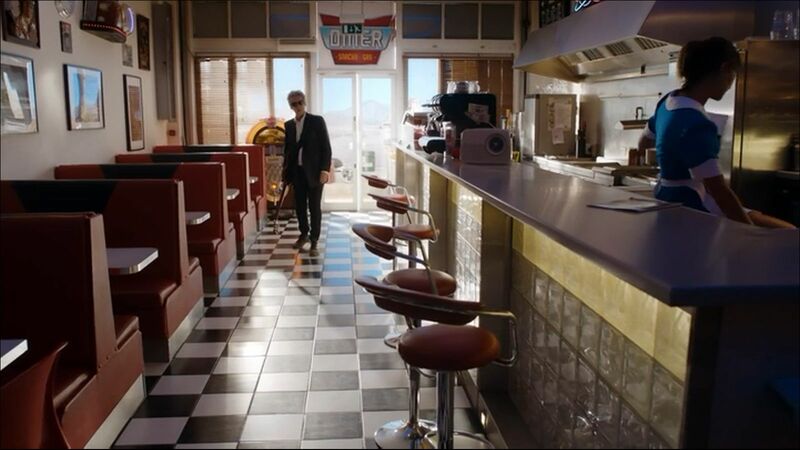 In The Impossible Astronaut, the Diner seemed to be in Utah, near Lake Silencio where the Doctor faked his death. Outside cars go by, conveying it to be a busy street, as though it's in the heart of a town or city, certainly within a town's borders. Most likely the trio would not have driven from Utah to the outskirts of Nevada before stopping at a diner to discuss things. In Hell Bent, the Diner was specifically in Jackson, Nevada, literally in the middle of the desert, so if the town in anywhere nearby, it's not in sight. 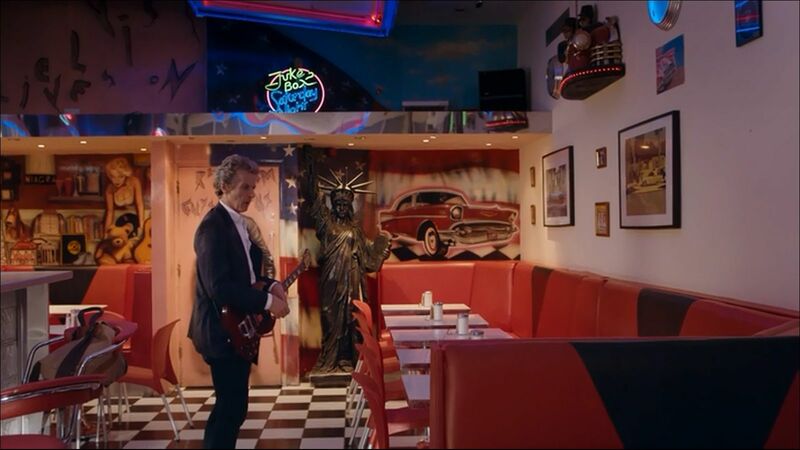 There are close similarities, but they are not the same diner; the TARDIS-diner of Hell Bent is not exactly the same Terran diner of The Impossible Astronaut, which even the Doctor vaguely seems to recall the diner being on "the other side of the hill," the respective episodes each being entirely in different states notwithstanding. 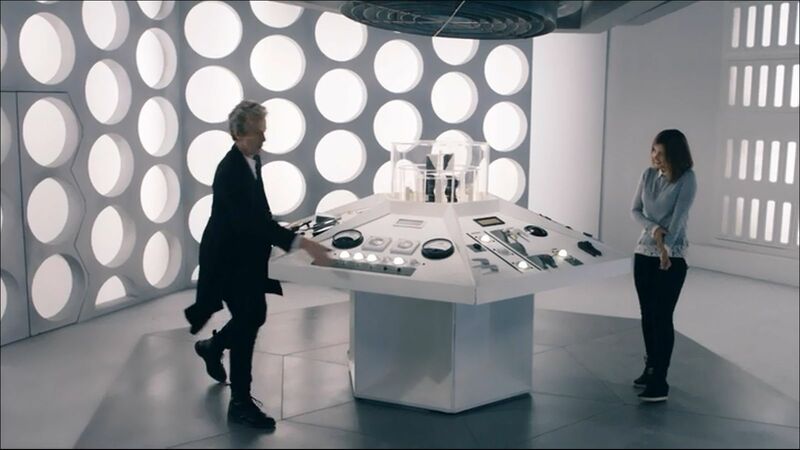 Finally, when the TARDIS-diner departs, it leaves the Doctor alone, along with his TARDIS that Me and Clara clearly must have retrieved while the Doctor was unconscious, before leaving him with the man at the side of the road. Where did all the stuff go that was outside the diner? Was it part of the chameleon circuit? If Me cannot get the chameleon circuit to work, their TARDIS exterior shell retaining that of the diner, will all that "parking lot" Stuff appear each time they land, or is it Gone For Good somewhere? For that matter... where th'heck did the truck go in which the Doctor arrived (let alone how and from where did the Doctor even get the truck in the first place)? 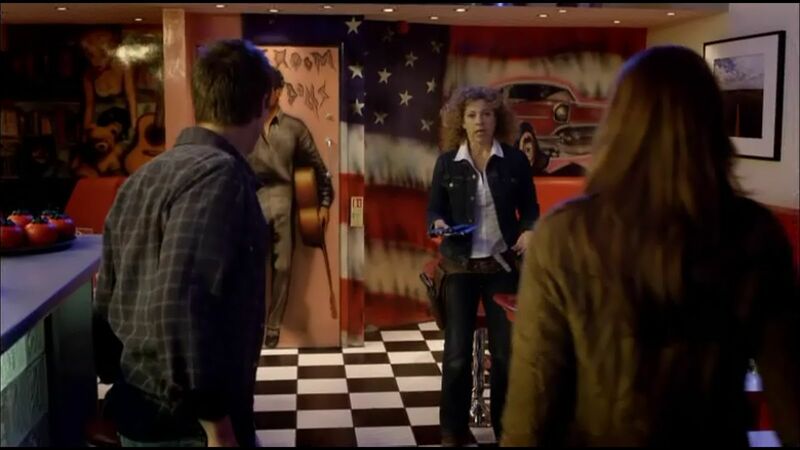 Amy, River, and Rory arrive at the diner. There is a young black man manning the place. Above the door is a large round circle with an Exit sign. 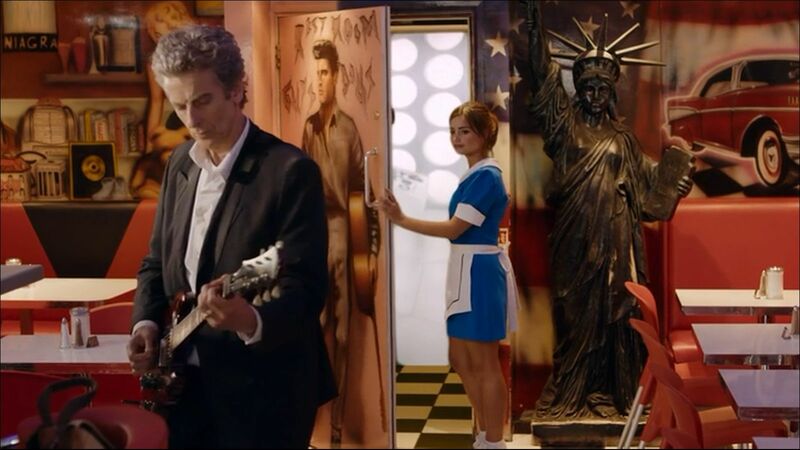 There are more framed pictures on the wall than in the TARDIS-diner. The Doctor arrives; the counter top has more food industry items on it. The exhaust hood over the cooking area is very different, taller, seemingly set higher. Above the door is more detailed signage, indicating the diner's name. Outside the name of the place appears to be Snacks and Gas. Inside, "Snacks and Gas" are below the word diner. Above and overlapping the word diner, the name of the place, there appear to be three icons of some sort. The counter has a distinctive purple trim, along the side and lapping above. Not in this shot, but the booth seats do have the same black triangles as in Hell Bent. The lighting in this shot notwithstanding, the counter does not actually have the purple trim. This diner does, however, have a large Statue of Liberty, missing from the Impossible Astronaut diner. Here is a clearer shot of the lack of the Statue of Liberty. Now the empty space next to the door has the Statue of Liberty. At least the wall murals to the right of the restroom door remains the same in both diners. 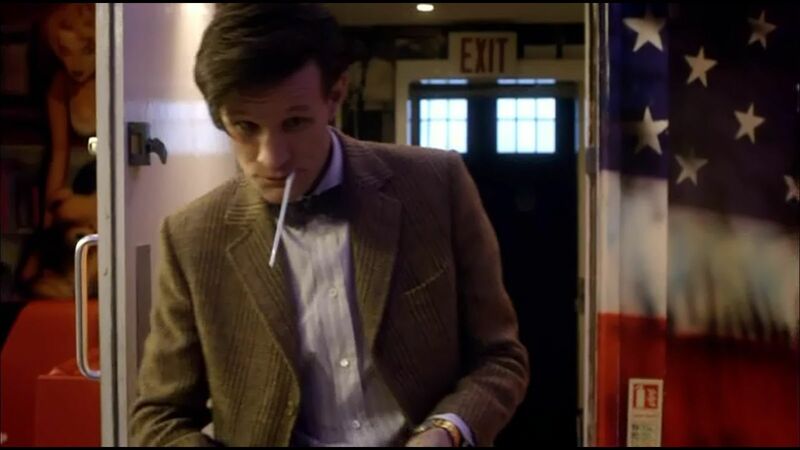 The Doctor emerges from the door marked Restroom. Behind him is a back door exit, suspiciously Police Box-like. 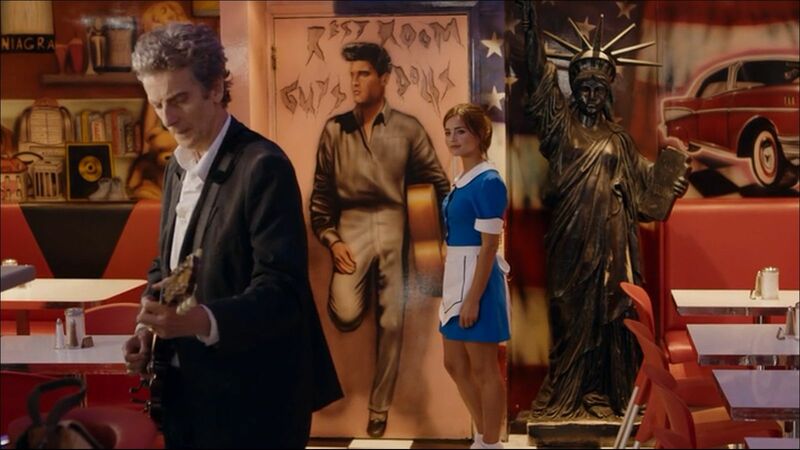 The TARDIS-Diner Restroom door goes directly to the main control room of the chameleon circuited time-capsule. 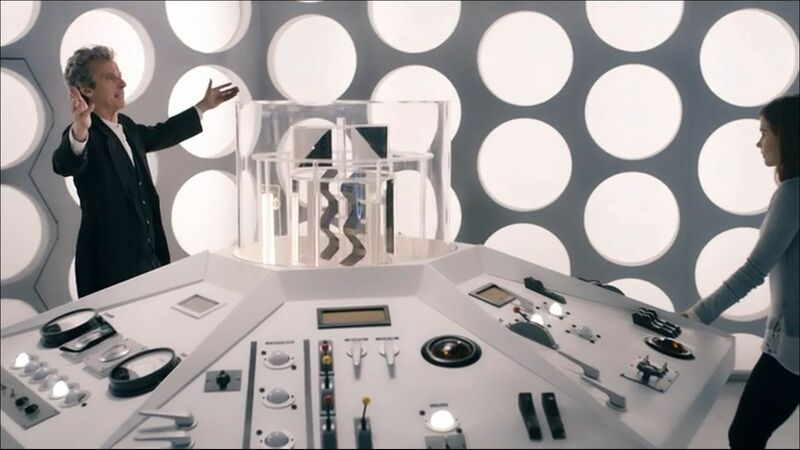 There is nothing like the joy of seeing the earliest Classic Era TARDIS interior style.